Ooh, tiki! Florida doesn't disappoint in this arena with grand Tahitian Inn of Tampa. The Tahitian Inn sports great Polynesian lettering to go along with the arrowheads pointing off the top of the sign. 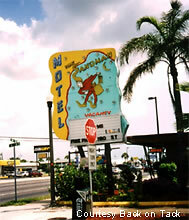 Most likely the Grant Motel was built to allure Florida tourists who were visiting Sunken Gardens, which is just a hop, skip and a jump down the road. It is one of the oldest attractions in Florida opened in 1935. The park, recently taken over by the state, is set 15-feet below street level and is filled with hundreds of tropical plants and some scattered birds and animals. 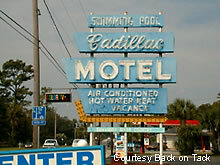 The Cadillac Motel is located on North US 19 in Fanning Springs, Florida. It is locally owned by a couple and is within walking distance of the famous Swanee River. "The Swanee River (Old Folks at Home)" is the official state song of Florida. There is a memorial to its author, Stephen C. Foster, in White Springs even though he never actually visited the state. 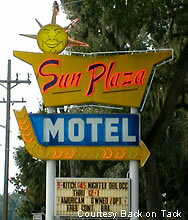 The Sun Plaza is located on SR 40 in Ocala, Florida. The 47 room hotel has been family owned and operated for 40 years. It has many of the little amenities that you just don't find in the chain hotels anymore; a large children's playground, picnic area, and even shuffleboard courts. 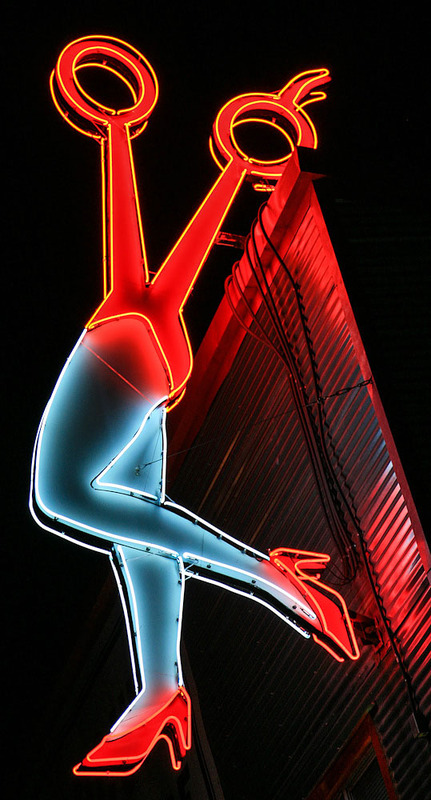 The place is well kept up and with its neon marquee, the Sun just seems to light up the roadside. The Sandman Motel is a fantastic pastel color. Looks like a scene straight out of a dream. Author Jack Kerouac spent his last years in a home not far from these motels with his wife and mother. His life "on the road" ended here in 1969 with an abdominal hemorrhage in large part due to his alcoholism.